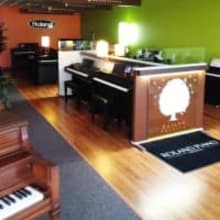 Family owned and operated since 1980, JML Piano specializes in sales of acoustic pianos, digital pianos, keyboards, and piano / digital piano accessories at great prices! We sell lots of digital pianos to public schools, universities, community colleges, and churches which enable us to get maximum discounts on what we buy and sell. We believe in providing our customers great service after the sale, and will ship to you within 24 hours... the same day when we can! Shop us or Pay Too Much! Thank you in advance for your business!! I will ship with tracking provided to the US 48 states. I will ship within 24 hours (unless noted). I ship fast! No International shipping available at this time. Local pickup in Fayetteville, NC, or delivery in Central NC Upstate SC is available. Some items are FREE Shipping... As is and used items do not qualify for FREE Shipping. Buyer receives full refund in their original payment method less any shipping charges (including free shipping charges) within 7 days of order. All items must be shipped in original box(s) with all parts, materials, owners manuals, and accessories in box. Buyer is responsible for return shipping charges.